Tomb of Avrahom, Yitzhak (Isaac), Yakov (Jacob), Leah, Rivka, Adam & Chavah (Eve), and Esav's (Esau) head." 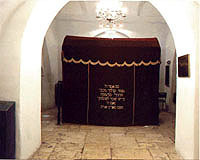 "Kever Yosef (Joseph) in Shekhem" and other important sites. Hevron # 1 - Cave of Makhpela is under the structure which was originally constructed by king Herod. Hevron # 6- Kever Yishi (King David's father) and Ruth's Kever at this location which is less than 1 kilometer from the Cave of Makhpela. View enlarged photo to see important historical information. Kever Rochel # 1 - in Bethlehem. This picture shows the Kever the way it looked for centuries (it has since been fortified to protect it). Kever Rochel # 2 - in Bethlehem. Same time as #1, different angle (an archive shot). Kever Rochel # 3 - Bethlehem - also as 10" x 8". An intimate inside photograph, before the renovations. 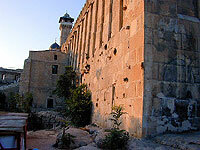 Outside wall of the structure built on top of the Cave of the Patriarchs (Mara HaMakhpela) in Hevron. In the lower left corner of the photo is one corner of a very large Sukka. 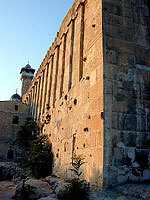 Outside wall of the structure built on top of the Cave of the Patriarchs (Mara HaMakhpela) in Hevron.